While many politicians seem like they possess more bark than bite, several have been able to physically back up their words when needed. This list features ten badass politicians who demonstrated bravery in the face of danger, or significant physical prowess during their storied lives. Ugandan Dictator Idi Amin was very much a bad guy, not to mention a bizarre one. At the height of his power he claimed that he was His Excellency, President for Life, Field Marshal Al Hadji Doctor Idi Amin Dada, VC, DSO, MC, Lord of All the Beasts of the Earth and Fishes of the Seas and Conqueror of the British Empire in Africa in General and Uganda in Particular, as well as the uncrowned King of Scotland. He must’ve had one huge business card. Yet despite his seeming buffoonery, he was a physical badass; at 6’4″, he was the Ugandan light heavyweight boxing champion from 1951 to 1960, as well as a swimmer and a rugby forward. He also served in the King’s African Rifles, part of the British Colonial Army, from 1946 to 1962 and eventually became one of the first two Ugandans to become officers. He continued to rise up the military ranks of the now independent Ugandan Army before seizing power by overthrowing his predecessor as president. At his point, his story goes from badass to just plain bad. But seriously, how many other dictators were boxing champions? Imagine a one-on-one fight between Amin and, say, Hitler or Kim Jong-il, and tell us it wouldn’t be over in half a round or less. Even as President, Amin achieved a technical knockout of Uganda’s boxing coach in December of 1974, not long after Amin boxed (less successfully) with Olympian Francis Nyangweso in October 1974. Although Nyangwezo ultimately won the bout, Amin cut him early on, and even fought for multiple rounds. A head of state challenging an Olympic quality boxer? Say what you will about Amin, but the man had some audacity. You may merely think of the Austrian Oak as an action star with scripted scenes, but that’s because you never had to fight the guy. For one thing, he served in the Austrian Army and, as such, had military training. He then became one of the greatest, and most influential, body-builders of all time. He won three professional Mr. Universe competitions and seven Mr. Olympia competitions. Yet, he did not just have an impressive physical appearance. He was also quite strong. He won an International Powerlifting Competition, a German Powerlifting Competition, two men’s weightlifting competitions, and could bench press nearly 500 lbs. Once he became an actor, he learned martial arts skills as well, including sword training, from notable weapons masters and martial artists such as Joe Lewis, Chuck Norris, and Kiyoshi Yamazaki. He showed off his skills in numerous blockbuster films, that cemented his popularity and fame around the world and propelled him to the California governorship. Vladimir Putin is best known as Russia’s strongman leader for the past decade or so. He has see-sawed back and forth between Russia’s Prime Ministership and Presidency, either way remaining a very powerful man. Not only is he in charge of the world’s largest country, with one of the world’s largest stockpiles of nuclear weapons, he is personally a dangerous man. During the Cold War, he was a member of the notorious KGB, and has been an avid martial artist ever since his youth. His honors include Master of Sports and Champion of Leningrad in Sambo, 6th degree black belt and Champion of Leningrad in Judo, and 6th Dan black belt in Kyokushin kaikan. To stay healthy, he also fishes, skis, and ice skates. He has flown a military jet, gone scuba diving, and shot tranquilizers and other darts at various wild animals. For his many accomplishments, he has been awarded France’s Legion of Honor, and was named Time Magazine’s Person Of The Year. On top of all of that, the Chapel of Russia’s Resurrection views Putin as the reincarnation of Paul the Apostle and Vladimir the Great. So, to top everything off, he has a literal cult following. 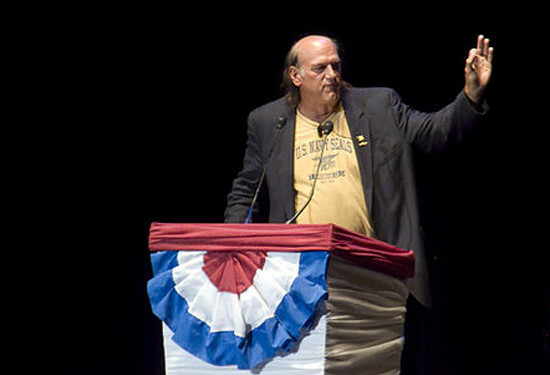 The second star of Predator to become Governor, Jesse “The Body” Ventura actually manages to out-badass Arnold. Ventura served in the United States Navy from 1969 to 1975, as a Storekeeper Third Class. He belonged to Underwater Demolition Team 12, which merged with the Navy SEALs in 1983. For his military service, he has been awarded the National Defense Service Medal, and the Vietnam Service Medal. In the mid-1970s, he also joined a motorcycle gang, and began weightlifting and wrestling. He was even a bodyguard for the Rolling Stones for a short time. He subsequently became a notable professional wrestler until 1986, and then began an acting career in 1987. From 1991 to 1995, he was mayor of Brooklyn Park, Minnesota and from 1999 to 2003 Governor of the state. In short, he received military and wrestling training, was intimidating enough to belong to a gang and work as a body guard, wrestled for years (which, while scripted, is one of the most physically challenging activities imaginable,) and then went on to have a successful career in acting, politics, and writing. Not bad for a guy most famous for a weird chin and owning more feather boas than should be considered healthy. Vitali and his brother Wladimir are, quite possibly, the greatest boxing brothers in history. Between the two of them, they have dominated all of the major heavyweight championships in boxing for the past half-decade. Vitali has won 45 fights, versus only 2 losses. He currently holds the WBC Heavyweight Championship, while also serving as a member of the Ukraine’s Parliament. As such, he is perhaps the single-most physically dangerous person currently holding a political office. If being a heavyweight champion and elected politician is not impressive enough, this overachiever is also married to a former model, and is the first heavyweight champion to hold a PhD. Yet, all this success has not gone to his head, as Vitali seems like a good guy who is not tainted by any notable scandals, and donates to various charities. The former Soviet Union has produced quite a few physically imposing politicians, such as Karelin, possibly the greatest wrestler in modern history. From 1988 to 2000, Karelin, known as “The Experiment,” dominated Greco-Roman wrestling like no one else in history. He has won three gold and one silver medal, at four different Olympics, along with nine world championships, twelve European championships, and an undefeated record in mixed-martial arts. Oh, and he was also a colonel in the Russian Tax Police. Imagine not paying your taxes and having this guy show up! After retiring from wrestling, he joined the United Russia party, and won elections to the State Duma, as a representative of the Novosibirsk Oblast, in 1999 and 2003 and then as a representative of the Stavropol Krai in 2007. In terms of personal bravery and fighting abilities, Old Hickory is, by far, one of the more intimidating Presidents in American history. Some highlights of his life include joining a militia at age thirteen during the American Revolution. He became a captive during the war and refused to clean a British officer’s boots, which earned him a slash from a sword that permanently scarred his hand and head. Decades later, he served as a colonel, and then major general, in Tennessee’s militia. In 1806, following an incident where Jackson struck a man named Thomas Swan with a can, a friend of Swan named Charles Dickinson (not the author) insulted Jackson in a newspaper statement. This caused Jackson to challenge Dickinson, a skilled marksman, to a duel. Jackson allowed Dickinson to fire first, and the challenged shooter indeed hit Jackson near the heart. Although the bullet broke some of Jackson’s ribs, Jackson wore clothing and stood in such a way that Dickinson would not manage to hit his target as intended. Jackson then took aim, and fatally shot his foe in the chest. Jackson next became a national hero for his victories at the battles of Horseshoe Bend (1814) and New Orleans (1815) in the War of 1812. He continued his military service in the First Seminole War, during which his enemies called him “Sharp Knife” for his brutal tactics. He ultimately became military governor of Florida by 1821. After having amassed a career of military glory, Jackson became America’s seventh President, serving from 1829 to 1837. Yet, his violent history did not stop there. In 1835, an insane man attempted to shoot Jackson, but both of his pistols misfired, causing Jackson to attack his attempted assassin with a cane until the failed assassin was restrained. While Caesar may not have been as much of a buff badass as he is being depicted on Spartacus, as far as politicians go, Caesar had a career full of adventure and bravery. Throughout his career, Caesar lived a hard life. Before he became the Caesar we all know, he survived captivity by pirates, and later got revenge upon them. Then, when he entered politics, he embarked on one of the most extensive military careers of any acting politician in history. In less than twenty years, Caesar traveled to Gaul, Britain, Greece, Egypt, the Middle East, North Africa, and Spain and, along the way, won victories over such determined opponents as Vercingetorix, Pompey, Ptolemy XIII Theos, Pharnaces II, and Juba I, among others. Caesar also got his hands dirty, or rather wet when the situation required. He personally leaped into a boat to save his men in Alexandria, and also swam with one hand while holding books above water in his other, despite having his enemies loose arrows at him. Earlier, in 80 B.C., Caesar reportedly was the first Roman to scale a siege ladder during a battle of Mytilene, and earned the right to wear a crown of oak leaves for his bravery. Theodore Roosevelt served in several major political offices from 1897 to 1909, including Assistant Secretary of the Navy, 33rd Governor of New York, 25th Vice President of the United States, and 26th President of the United States. Both before and after, Roosevelt participated in several of the most badass adventures of any American politician. In the mid-1880s, Roosevelt worked as a deputy sheriff in the Dakotas. In that capacity, he hunted down, and eventually captured, three outlaws who stole his riverboat and tried to escape north with it up the Little Missouri. He not only took the thieves back overland for trial in Dickinson, but guarded them for forty hours without sleeping. When the Spanish-American War broke out, Roosevelt resigned from his position as Assistant Secretary of the Navy, formed the famed “Rough Riders,” and served with them in Cuba. In 1912, when he attempted to reenter politics, a would-be assassin shot Roosevelt during a speech. Despite bleeding from a bullet wound, Roosevelt acted like it barely grazed him, and continued speaking for ninety minutes. After he lost the election, he went on an expedition to South America. When World War I broke out, Roosevelt attempted to raise an American volunteer force reminiscent of his Rough Riders, but the political revival who had defeated him for the presidency, Woodrow Wilson, refused this request. He’s lucky Teddy let him live after that. Yes, Napoleon eventually became Emperor of the French and King of Italy (at the same time, no less,) but he was not the son of an Emperor or King. Moreover, he became Emperor of a Republic while already serving as the political head of that republic. Napoleon’s rise to power occurred during the tumultuous French Revolution, and he earned the admiration and respect of his fellow soldiers through his personal bravery. The youthful Napoleon did not merely sit back and watch battles take place. At the Siege of Toulon in 1793, Bonaparte sustained an injury to his thigh from a British bayonet. In 1796, at the Battle of Arcole in Italy, the general tried to inspire his men by grabbing a flag and standing in the open amidst gunfire that killed some of those around him. In 1799, during his Egyptian expedition, to again inspire and reassure his troops, this time struck down with bubonic plague, he not only visited them, but even touched them, risking contracting the disease himself. During his political years, he still commanded military forces during battle, and continued to do so even after becoming Emperor. In 1809, at the Battle of Ratisbon, he suffered a leg injury that could have almost cost him his foot. After his exile to Elba, and subsequent return to France in 1815, when royalist soldiers were sent to capture him, Napoleon stepped out in front of them, opened his coat and said, “If any of you will shoot your Emperor, shoot him now.” Sufficiently impressed, they rallied to his cause. As any of you would. direct orders and tried to get the Congress to help him nuke Korea. But since Truman fired a war hero, he’s suddenly a bad guy. Don’t go around calling people like Andrew Jackson bad asses. Sorry, but he was still a badass. Also a jackass, but still a badass. The two are not mutually exclusive. Really? Your qualm is with Jackson? On a list that includes Idi Amin? oh yeah, Idi Amin.. People today probably know him from that film the Last King of Scotland, but in real life, he was a madman. He admired Hitler, was friends with Colonel Gaddafi and In the 70`s, he kicked all the Asians out of Uganda, and all of them came HERE. And they took over the whole area of where I live. Their`s a badass. NOT. And well, Hitler, he fought in WW I and was a messenger boy. Which took bravery. And he went from that to ruler of a country. So, when you think about it, Hitler was more badass than that thug Idi Amin. Teddy “Bad Motherf*ucker” Roosevelt second to that Frenchie?? Epic Fail!! Ok, let’s get this straight. Napoleon was the head of state of two countries, simultaneously. Not to mention standing right in the middle of gunfire for the hell of it. All this at the ripened hieght of five foot six. Roosevelt was a glorified cowboy. Idi Amin also fought in the Mau Mau Rebellion, against Mau Mau Terrorists. And Obama`s Grandad was a member of the Mau Mau and was tortured by British Soldiers in a concentration camp.. So, is it possible Obama`s grandad met Idi Amin? am I the only person, who, as a kid, wanted the gun Jesse Ventura had in Predator? Initially, i thought this was going to list politicians who were considered badass because of the risks and challenges they faced and had overcome during their political years…I’m such a girl. However, it seems to me that there are two lists going on here…the brave badass and the physically fit badass. The first is admirable, the second is nothing more than a bunch of inflated egos who go on to think they can do anything, including running a country or state, and we buy into it because we perhaps admired them for their physical accomplishments (Hello! Arnold!!!). We are so naive. Nelson Mandela and Fidel Castro, who by any comparison make the rest look like a bunch of nerdy kittens. Was elected as president and managed to transfer a country that had been racially divided for almost 50 years into a functioning democracy. Earning a huge esteem and prestige, both by his own people as well as the international community. Made a deal with Hugo Chavez (another one missing from this list) to exchange Cuban medical staff for oil, being the first ones to supply medical aid in humanitarian emergencies as the Haitian and Pakistani earth quake catastrophes and fighting blindness all through the third world. Fought a battle with major health problems, rescinded his position as president, but still, at the age of 86, regularly writes extremely lucid comments on international politics. How is spending 27 years in jail a credential to being a badass?